NORTHERN Ireland has one of the world’s highest prescription rates for antidepressant medicines according to new research, but fresh questions have emerged over what may be driving the trend. The analysis, carried out for The Detail and entitled ‘The Script Report’, examined 36 million prescription records from across the UK, including 3.5 million prescriptions written by GPs in Northern Ireland. It is the first time such prescription records have been released and while they do not identify individual patients, the raw data provided the basis for an international comparison to be carried out. However, the research questioned the conventional view that poverty and the legacy of the Troubles fully explained the high levels, prompting questions over the health service and its use of prescription drugs. 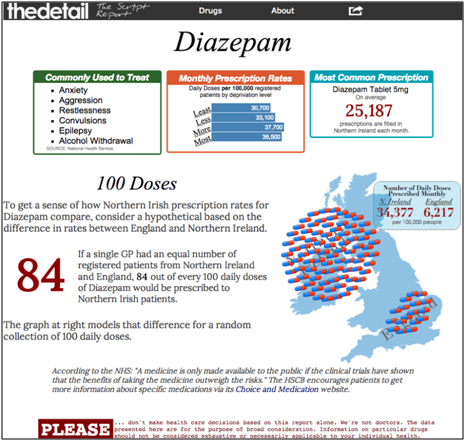 The Script Report was compiled by US data journalist Jon McClure for The Detail and provides interactive tables, maps and graphics that illustrate the separate prescription levels for the series of drugs, showing how rates compare between economically deprived and affluent communities. To see the report in its full interactive content click here. Antidepressant prescription rates in Northern Ireland far exceeded those of England and Wales, and were also higher than levels found in 23 countries featured in a global study which included Canada, Australia, Portugal, Denmark and Sweden. In the six month period examined, from April 2013 to September 2013, GPs here prescribed enough antidepressants to give every man, woman, and child a 27-day supply at the Defined Daily Dosage limits. In England GPs prescribed enough for 10 daily doses per patient. The figure in Wales was 19. 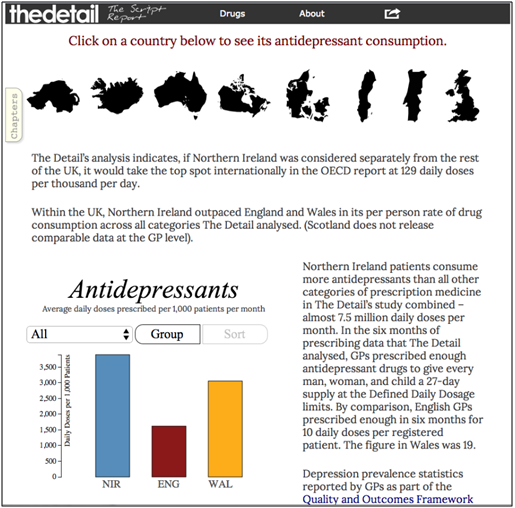 Northern Ireland’s prescription levels are higher than other UK regions with a similar economic profile, or with similar or higher rates of depression. Doctors interviewed for The Script Report pointed to a rising problem among age groups that are too young to have directly experienced the Troubles. And in addition to the findings on antidepressants, the Script Report studied rates for over 50 drugs that also included sedatives, painkillers and anti-anxiety medicines. In more than 40 of the drugs, Northern Ireland prescription rates exceeded those of England. Tom McEneaney of Aware Defeat Depression, a mental health charity in Northern Ireland, told The Script Report of the continuing impact of the Troubles: “Coming out of the Troubles, people are beginning to talk about and recognise post-trauma anxiety, depression and stress. Dr Tom Black, chair of the BMA (British Medical Association) Northern Ireland GP Committee, said other factors were also playing a role in the increase in prescription rates. He said public campaigns aimed at raising awareness of depression, as well as a health questionnaire for patients, had led to some `self-diagnosing’. There was a belief that this left GPs with less power to make decisions based solely on the symptoms they observed. He said there is also evidence of some GPs coming under extreme pressure to provide prescriptions to individuals who are aggressively demanding drugs. Other medical sources contended that longer periods of medication for patients, which are provided in a bid to deliver better outcomes, had contributed to a rise in prescriptions. A further contributory factor for high prescription rates that was cited by experts was the delay in accessing alternative or additional therapies such as counselling. The World Health Organisation’s (WHO) Defined Daily Dose (DDD) system was used to make drugs comparable in the study, but it is a unit of measurement and does not necessarily reflect what a doctor might prescribe to a patient, as this will often depend on individual characteristics. The study’s methodology is explained in full in The Script Report. The findings of The Script Report add weight to calls for further examination of the cocktail of issues fuelling Northern Ireland’s prescription rates. Responding to the findings a spokesperson for the Department of Health for Northern Ireland said: “The Health and Social Care Board (HSCB) are currently establishing Primary Care Talking Therapies Hubs in each [Health] Trust area. They said health authorities had made an initial investment of £1.7million to support the establishment of the Hubs and to extend the range and scope of psychological therapies across mental health services.